Transform your last of the season strawberries! 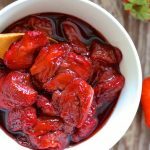 With just 3 ingredients and a couple of minutes hands on time you could have yourself a bowl full of these intensely sweet, sticky & syrupy Vanilla Roasted Strawberries. Line a baking tray with baking parchment or a silicone mat. Wash and allow the strawberries to dry. Hull the strawberries and cut in half. if you have any extra big ones cut into quarters. In a bowl mix the maple syrup and vanilla. Add the strawberries to the bowl and stir well until coated throughly in the maple vanilla mixture. Pour onto the prepared tray and bake for 30 minutes. Remove from the oven and turn them all over. Immediately scrape them from the tray and into a bowl or jar of some kind.Make sure you scrape all the jammy saucy bits in too. The strawberries don't look saucy immediately but once you scrape them into a bowl, they get saucier as they cool. Vanilla bean powder gives the best flavour. It might seem expensive but a little goes a very long way. My bag has lasted well over a year and is still going strong. If you can't find it then you could scrape the seeds from a vanilla pod instead. If you only have vanilla extract use ½ teaspoon but please bear in mind that the flavour will not be as good if you use that.